The article considers the feasibility study which is a part of the efficiency assessment of public-private partnership programs. We consider this type of assessment as a form of benchmarking of foreign practices of foreign countries with a developed institution of public-private partnership. We present the feasibility study in the most scaling format of its application considering all the factors that are taken into account by the public partner in the process of consideration of the project proposal. Each element of the assessment is reviewed from the perspective of its application abroad and we give step-by-step recommendations for its implementation. We pay special attention to ecological and social feasibility studies because of the high risks associated with these factors. At the same time these factors are least susceptible to quantitative analysis and are least studied in the Russian practice of public-private partnership. Krykanov D.D. (2017). 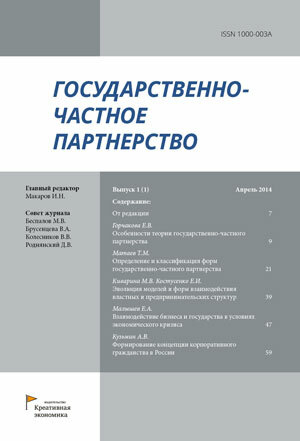 Feasibility study of public-private partnership projects: analysis of Russian and international practices [Otsenka osuschestvimosti proektov gosudarstvenno-chastnogo partnerstva: analiz rossiyskoy i mezhdunarodnoy praktiki]. Public-Private Partnership, 4(2). (in Russian). – doi: 10.18334/ppp.4.2.38144. (2000). Guide to the Project Management Body of Knowledge: PMBOK Guide Project Management Institut. Alicia H. Munnell (1992). Policy Watch: Infrastructure Investment and Economic Growth The Journal of Economic Perspectives. 6 (4). 189-198. Chapman C.B., Ward S. (2003). Managing Project Risk and Uncertainty: A Constructively Simple Approach to Decision Making John Wiley & Sons Ltd.
Dixon T., Pottinger G., Jordan A. (2005). Lessons from the private finance initiative in the UK: Benefits, problems and critical success factors Journal of Property Investment & Finance. 23 (5). 412-423. doi: 10.1108/14635780510616016. Kusek J.Z., Ray C. Rist (2004). Ten steps to a results-based monitoring and evaluation system : a hand-book for development practitioners The International Bank for Reconstruction and Development. Shoniber U. (2005). Budet li rabotat skhema gosudarstvenno-chastnyh partnerstv v novyh gosudarstvakh – chlenakh ES [Will the scheme of public-private partnerships function in the new member states of the EU]. Nedvizhimost i investitsii. Pravovoe regulirovanie. (4). 40-43. (in Russian).